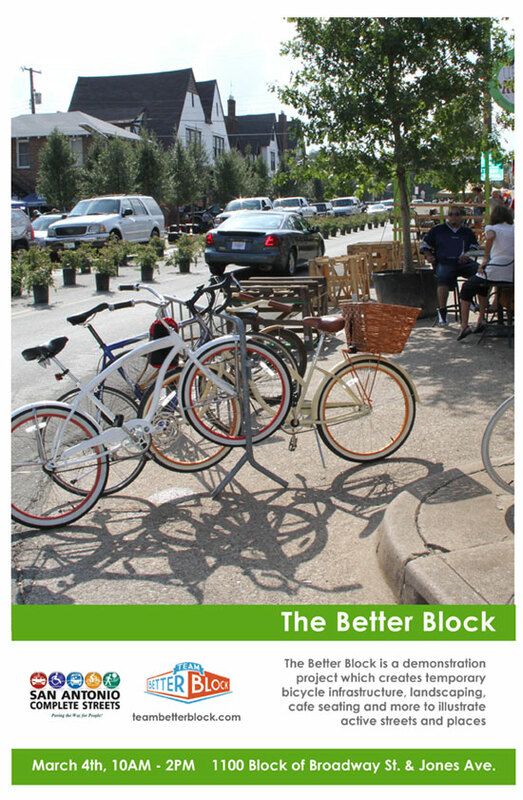 The city of San Antonio in collaboration with Team Better Block is hosting its first Better Block project on March 4th. The project will focus on the 1100 block of Broadway Street and Jones Avenue in the North East section of downtown. The event will take place alongside the city’s second SiClovia and will help spotlight ways to revitalize the area. If you are interested in volunteering for the project, please email us at info@teambetterblock.com. The first planning meeting is open to all and will take place on January 19th at the VFW located at 10 10th Street, where an overview of the project will be presented and opportunities to take part will be discussed. The facebook invite for the event is located here.